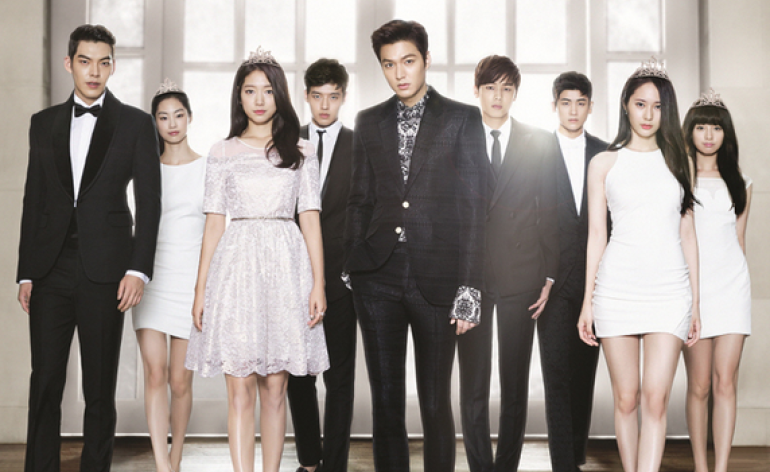 This review regarding last autumn's drama The Heirs - Who wears the crown has to bear the crown will not only be about the easy-to-understand-plot but mostly about things I noticed besides the elite high school love story. Jeguk Group's second son Kim Tan (Lee Min Ho) has been living in California for some time, due to some difficulties with his family, when he gets to know Cha Eun Sang (Park Shin Hye) there, a high school girl who has come to the USA to meet her sister. The two end up doing a lot together until Eun Sang has to leave again, whereas she also gets to know Kim Tan's fiancé Yoo Rachel (Kim Ji Won). Back in Korea, Eun Sang thinks she'll be able to return to her normal life but it turns out her mother - the mute head maid of the household of Kim Tan's mother - and Eun Sang have to move into the mansion. Furthermore Kim Tan has started to like her, which leads to the father of Kim Tan - the CEO of Jeguk Group - putting Eun Sang into the same high school as Kim Tan and her best friend Yoon Chan Young (Kang Min Hyuk). All this should make Eun Sang realize why she should stay away from Kim Tan but only gives this rich boy the chance to follow her around. Choi Young Do (Kim Woo Bin), the former best friend of Kim Tan and now enemy number one, is the head of the gangsters at the school, who take care of humiliating the students attending the school via the welfare program. Eventually he finds out that Eun Sang is in the program too and the fact that Kim Tan likes and tries to protect her doesn't help very much. It only encourages Young Do to pester Eun Sang to his heart's extent. Eun Sang unintentionally stirrs up everything and everyone of the high society at Jeguk High School and even manages to tame Young Do a little bit. The second son of Jeguk Group doesn't live an easy life although he could have anything he want. His brother was the reason why he went to California in the first place and his father has never really shown any real affection for him, Kim Tan was always only the favourite son and hence heir of the company. When Cha Eun Sang enters his life he seems to finally have found the person to love. Unfortunately the two are from different social classes which makes it almost impossible for them to be together. Eun Sang's life has never been easy, as her mother is mute, her sister went to California and she herself has several part-time jobs to maintain an income. Her best friend Chan Young attends the best high school in the country, whose owner also runs many other companies throughout Seoul. When she's forced into attending Jeguk High School, she experiences again what it feels like to be surrounded by people who can afford everything in life, even treating the people like the want to. The heir of Zeus hotel has been the best friend of Kim Tan but since a major argument those two hate each other. Young Do rules the school in terms of humiliating other students and making everyone avoid him. His personality is quite ugly at the beginning but that may change - not just because of Eun Sang's influence. Young Do has not the best relationship with his father, who always makes him suffer in judo training. His mother left, when he was a young teenager, which has turned him into an angry boy who wants to fight all the time. This review only depicts my personal feelings towards this production! At the beginning I have to say that even though this drama lacked many things in my opinion, I still liked it somehow. Let's just say it's okay. The first thing that bothered me was, that Kim Tan has supposedly lived in the USA for quite some time but his english skills are really lacking. I understand that some people might not have a perfect pronounciation and I don't expect anybody to talk like a native but if you want to show a character, who goes to an english speaking school, he/she should at least speak english without making people watching the series feel awkward. Secondly, why on earth did the writers/producers/directors/... choose a high school setting for this story?! I mean, who does not agree with me that the majority of the students look more like college or university students? The story could have been told the same way if the scene was a college. If the setting can't be changed they could have at least picked actors that match the high schooler age somehow... Well, I guess that fact will never change as it's the same with american series. It's not that I was totally dissatisfied with the drama, for example the actress always playing a very mean character (in this case it was the chairwoman of Jeguk High School) did a very good job of displaying one of the most despicable persons in the drama. I'm sorry, this post got so long, I already cut out a lot, since I have a lot to say about this drama. If you have something to add, please do so in a comment. Although only lasting for four short episodes, after watching this mini drama, 20 Years Old, I just felt the urge to blog about it, so that many more people will watch this cringe-worthy series, full of cuteness. How would fans & sasaengs react, if their favourite idol/bias started dating - be it either another idol or a normal citizen? We all know, most of them would be sad, angry and out of their minds. Kim Hye Rim (Lee Da In), a normal 20-year-old college girl and Lee Ki Kwang (Lee Ki Kwang), a member of the well known idol group B2ST/BEAST experience exactly the situation I explained before. The two went to middle school together and meet again 4 years later. Back then, Lee Ki wasn't an idol but the one stealing Hye Rim's first kiss. The two of them never saw each other again until this very day, nonetheless, the feelings for each other haven't vanished completely. They start dating secretly because of Lee Ki's idol status, until they get exposed one day. Is there a chance for the two to be together despite the difficult circumstances? This pure and innocent girl has never dated in her life and furhtermore just experienced what's it like to have an unrequited love. When she meets her former middle school friend Lee Ki, she starts having feelings for the handsome idol, although she was not interested in him before (unlike her roommate and best friend Ga Young). After some consideration they start dating and Hye Rim gives her silent consent to only be able to date him in secret. When their relationship almost gets uncovered, she goes through a very tough time, having to deny she was his girlfriend. After having tried to date again, they are exposed for real and they have to seperate. Heartbroken Hye Rim gets harrassed by sasaengs and doesn't even receive a message from Lee Ki. "Dancing Machine" Lee Ki is dating secretly - and even a plain college student. When rumors of the hansome idol are spread about him dating, he's in a dilemma. He's been in love with Hye Rim since middle school and now he finally got the chance to be happy with her, when sasaengs and reporters ruin his dreams of being together with Hye Rim. There's no escape from the reporters, nor a chance to meet his love again - is there? Within two minutes I had decided that I had to review this mini series. This lovely story about an idol dating a normal person has really caught my attention. Although I sometimes couldn't quite stand the cheesiness of korean aegyo, those two were just too adorable. Lee Da In and Lee Ki Kwang just displayed a perfect couple, you could feel the chemistry between those two actors. Usually you don't see a lot of kissing in korean dramas (you can't call it kissing most of the time but sometimes they manage to have the perfect on-screen kiss), so I was more than surprised that there was more kissing in this 4-episode-drama, than in a 16-episode-drama. This series is definitely worth watching, also because it's only 20 minutes per episode. Actually I would have liked it if there were more episodes but like this it is as if you were watching an extra long movie.